Q: Do I have to have a permanent internet connection to use the software? Q: How long have you been in business and how many customers do you have? A: We have been in the programming/consulting business for over 15 years and have at various times had relationships with hardware support companies. We have had customers running on this and previous versions since mid 2000. We do not provide any information about our customers. Sorry. Q: I have a 13 person office. What would a typical setup look like? The Firewall would have two network cards; 1 goes to the same hub (switch) as the workstations using standard ethernet cable, and the other goes to the router/satellite/DSL modem. The Server should have our Firewall License installed to protect your internal network. 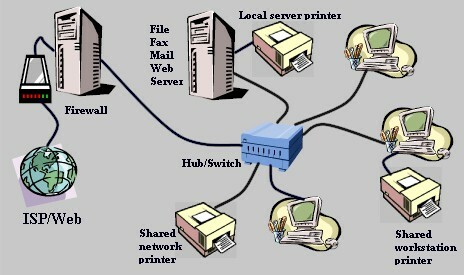 Another server provides all other network services like mail, web, fax, file server (with print services), etc. and those servers are connected to the same hub as the user workstations. Although not recommended, you could combine the firewall and the "services" server on the same pc. The reason the firewall should be separate is to make it harder for a hacker to do damage in the event that someone did get through. Q: I have a 230 person office with an existing network with a permanent T1 to the internet. How could I use your software? Assuming that you already have a decent firewall to protect that network, you could use our software to replace your existing file, mail, fax, and web server(s). The next release due out soon will allow our firewall to act as an internal and external firewall. This will allow you to use our firewall internally to control traffic and security between subnets. Larger companies like yours could benefit from this new feature. Our web server uses the latest fully featured Apache SSL server software and should work quite well for most companies. If you have a high volume requirement you may require a more advanced web server than we currently offer but our other servers are more than capable of handling an office of your size. You would require, and probably already have, fairly decent hardware. Our software would help you get the most out of your existing equipment, especially if you are due to upgrade your servers. Q: Your software runs on Linux right? Do you provide source code since it is a GNU type system? A: Yes and no. We used the RedHat distribution originally. In order to provide just the basics and to improve security, we normally don't even allow user logins on the server installation. The source code would be useless to have on the server but is readily available via RedHat. The source code for our program is not distributed for security reasons but could be made available under certain circumstances. A: We liked it! You should understand that Linux distributions are really only different in the packaging. RedHat and others have modified some key elements but generally just provide their particular setup and management tools along with their opinion on how the system should be 'structured' as far as directories, partitions, etc. RedHat came with a fairly lean, secure, robust kernel (main brain program for the operating system). Other than applying patches, we have no need to change the way they do things. Performance tuning, web mail, and VPN services require significant kernel changes and is the primary reason why we call our version by a different name. Q: Why is your software any better than some of the other 'server' packages out there? A: The primary difference between us and most of the rest is that we came from a Microsoft environment and know that a very large percentage of companies out there need a specific type of system. Our software works on the most common type of hardware (IDE, ethernet, Intel, etc.) and is structured so that you really don't need to know Linux to take advantage of what most companies need and Linux provides exceptionally well despite an incredibly low cost. Customers generally don't care how it works, they just want it to work consistently without having to deal with the details. We take care of the details. Q: I'm using the Firewall & Mail server on one box. Why do I have to setup the Mail screens but also have to go to the Admin page to turn services on and off? A: The Firewall Mail tab is where you setup firewall 'rules' to what is allowed to pass through the firewall. This doesn't control services running on the Firewall. The setups on the Admin page allow you to actually turn on and off services running on that box. A: Not yet. We are working on it. You will have to use the Admin page to set the system time when daylight savings rolls around. We are also working on a time server option that will let you sync all of your servers to a standard internet time server. Currently, the firewall just allows time server packets to pass through if you give it the IP numbers that another internal computer may be trying to use. Q: We have a Mail server and a separate File server. Why do we have to enter all the user accounts on each server? You already have them on one so why not just copy them to the other? A: We considered that for quite a while. We are working on a new feature that will allow you to selectively copy users from one of our servers to another. The reason we don't 'copy' them from one to the other is because most companies don't want this. Specific users are allowed controlled access to specific servers and the services they offer. In a multi-server larger office this is particularly true. In a small multi-server office there is a need to have the copy feature and is the reason we will be including it in a near future release. Q: We already have a mixed bag of Novell and NT servers. Can I use your software without dumping my investment in what I have? A: Absolutely! We have servers running in an office that runs Novell, NT, a proprietary Unix system, DOS, Microsoft Windows, Macintosh, dumb terminal workstations, and more. That's one of the benefits of Linux over some of the others. It gets along with practically everything. The advantages using our servers to either replace or assist is that you can either start moving away from those servers that aren't doing what you need or allow you to add abilities that you just can't get with the others (at least for a reasonable price). Q: I've heard about a lot of programs lately that have backdoors or spyware stuff in it that sends information without authorization. Does your program send anything out without permission or is there backdoors that let you or anyone else have access? How can I believe you? A: Our programs do not send anything to anyone without your permission. In fact, the only way information leaves your server is by someone you have allowed access, and that includes us. Our installation CD does install quite a large number of GNU/GPL software that could possibly have such features but we are always on the lookout for programs like that and would immediately blacklist them when found. We are not aware of any way to gain 'backdoor' access to our program or to the server via our program. Access to the server must be granted by you using the 'Admin' configuration screen. In order for us to do auto-updates to your server via the internet, we must have your current admin password and be allowed access via your firewall. There is no way to access the server using our program without having a valid username and password and you must choose a good password and share it with us for auto-updates. We stake our reputation on our word. If that isn't sufficient, at your expense we would allow a third party to examine the source code to verify what we say is true (Third party must sign a non-disclosure agreement).